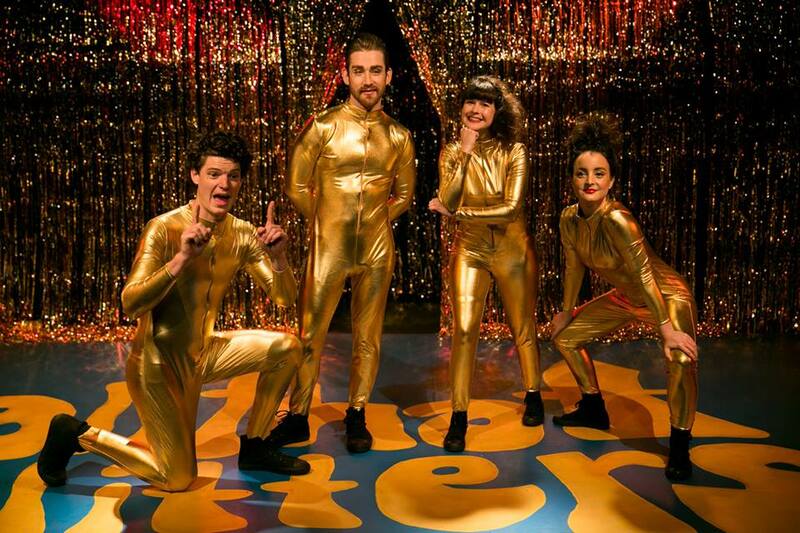 Four lanky people in gold morph suits, teased hair speckled with glitter, heads bowed, shuffling silently in line as they enter the space. They’re shot with invisible bullets – they retch and moan, their bodies spasm and contract, they bow their heads and snap straight again. Their arms cradle imaginary babies, that they rock silently – and then, as the lights blaze on and the music starts, the babies swing vigorously in time to the first words of Taylor Swift’s Bad Blood. They burst into an aggressive choreographed dance routine, gestures lifting literally from the lyrics in a hilariously camp routine made all the more bizarre from their stony faces – like, this might have just been the most serious thing in the world. At the end of the dance they announced themselves as The Last Great Hunt, and we applauded enthusiastically as they said they were putting on a play tonight to help save the lives of refugees. The scepticism on the faces of the other three Hunters as Chris revealed an illuminated sign reading “lives saved: 0” was our first clue that perhaps this was a little tongue-in-cheek (ah, second, if you took the gold dancing sausages any less seriously than they did themselves), which makes sense – when I spoke to director Gita last week, she said they play is about a failed effort to help, but then perhaps there’s value in that attempt. I make no secret of the fact that I love a Last Great Hunt play. The way they get inside your head and make you think long after the action’s over – but never preach you lessons; it’s always much more subtle than that. 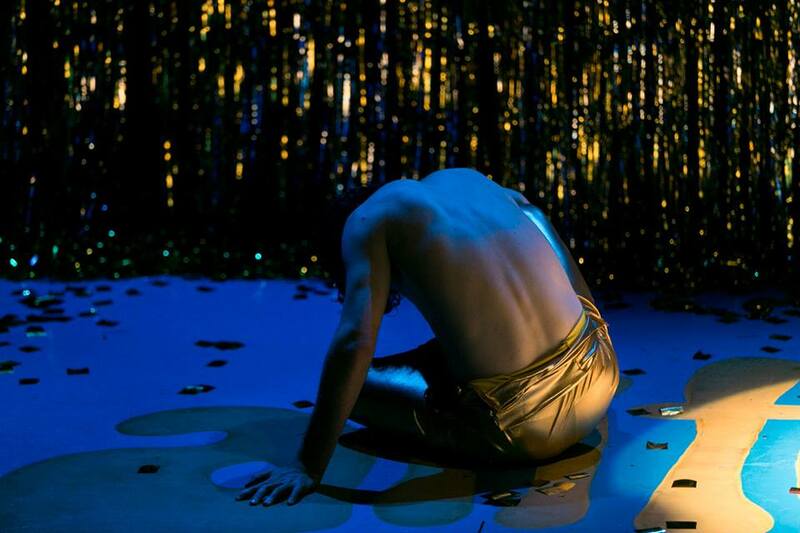 And All That Glitters is no exception – sure, that ever-illuminated sign was a fairly overt reminder of the play’s intention – but as always, it was something that made me laugh, challenged my thoughts, and made me feel something in my stomach after it was over. And, as always, I have no hesitation in recommending you go see it, too. The play-within-the-play follows two couples as they deal with the fact that the wife of one has bought a piece of art painted by a “child in a war-torn country.” It grates with the other couple – they find it confronting and uncomfortable – but they recoil at the accusation that their displeasure is racist, because as they smugly announce, they’re housing “brown people” in their back shed. The fact that the people – a man and his daughter – arrived at their back door is a slightly heavy-handed metaphor for Australia’s asylum seeker policy, that leads itself nicely to some lovely, gleeful jabs by the cast – “why would they go to the nicest house, not the nearest house?” and the self-congratulatory way the couples justify not letting them in the house, because ‘there’s a right way and a wrong way” to enter. That garnered a lot of laughs – a fair few of them from me, because I’m the kind of convert they were preaching to there. There was nothing challenging for me about ridiculing the government’s treatment of asylum seekers – I’m a disillusioned Gen Y law graduate. Trust me, I’m with them. But, in true Last Great Hunt style, they weren’t going to give me the easy way out, and let me sit smugly in that. Nope, this play is obviously going to go a little deeper. That’s something Gita said to me when we spoke last week. She told me she wanted to interrogate the responsibility of average citizens when the government is breaching asylum seekers’ human rights in our names. She said that she optimistically thought she might be delivered to audience members a handy how-to; she laughed as she told me how that turned out. And that’s what challenged me about All That Glitters. At the end of the play the Hunters put on, the couples’ changed perspectives lead Chris to optimistically point at the “lives saved: 0” sign, expecting the number to fly up. It didn’t, of course – for all the conversations the play started, or the thoughts that it generated in its audience, it didn’t save a single life. And Chris’s despair, then, was achingly familiar – as was his renewed effort to restage the play, with an alternative ending, in case that saved the people he was seeking to help. And again and again, after ending after ending failed to do anything. Adriane’s disgusted words to Chris as he sat helplessly, morph suit half-off – “you’re just going to sit on the floor? Get up” – hit me in my stomach. I’m Chris. I’m the person who aches with empathy and despair and who doesn’t do enough. How can I really help? If I care about this, what can I really do? All That Glitters is absurd, campy, gaudy and fun, and the rest of the audience burst into very well-deserved rapturous applause for the cast as they took their final – real – bow at the end of the show. But I felt hollow, and I sat still as the applause died down. Arielle said as the noise quieted that they were looking to just start a conversation on the issue – not cover the field, not deliver a neat how-to, but to explore and interrogate Australians’ attitudes to asylum seekers, and to understand the role we play. That red illuminated sign with the burning figure “lives saved: 0” seared itself into my brain – and I know Adriane said there was no cute metaphor to take away, but I couldn’t help it: for all my talk and outrage, and the circular way my friends and I nod in unison to mechanically deplore Peter Dutton’s life choices, there’s so much that can be done and so little I am doing. An existential crisis, a not-unwelcome Taylor Swift song stuck in my head, and a stomach still sore from laughing at some great gags in their serious refugee play: I’d expect nothing less from The Last Great Hunt, and All That Glitters definitely delivers. Go and see it. 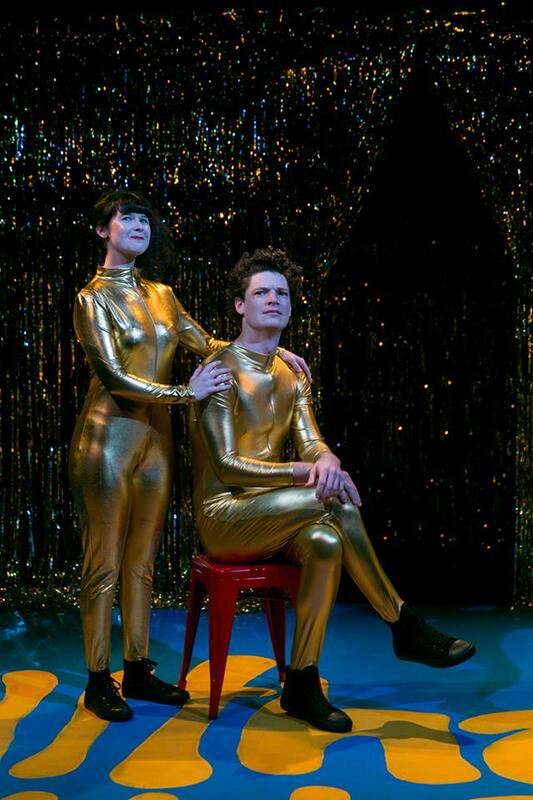 All That Glitters plays at the Blue Room Theatre until 29 August. Tickets from the Blue Room website.